Tropical Hainan is more than just weather, palm trees, great beaches and history… it’s also about sensational golf! From Lava rock to beaches from valleys to hill tops the sheer variety of golf courses and landscapes provide something for every golfer and of all skill levels. There are extraordinary courses waiting for you, some you would never have thought exist in China. 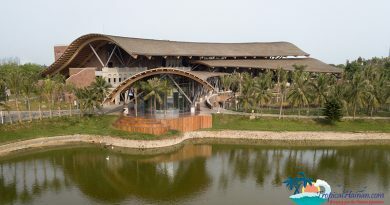 Follow us on tropicalhainan.com as we introduce you to various courses and holes on this tropical wonderland. Better still come and join us for a special time in 5 star accommodation and on world class golf courses, they are waiting for you and the choice is all yours. Mission Hills Haikou resort boasts 10 world class courses none better than the accolades given for the Blackstone course, previous host to the World Cup of golf, the McIlroy-Woods matchplay, various LPGA championships , World Celebrity Pro-Am and more. Then there is The Sheraton/Dunes at Shenzhou that treats you to some outstanding holes along the South China Sea, Mystic Springs with one of the toughest holes in Asia and the exclusive Blue Bay which hosts the LPGA to name just a few. Whether you start in Sanya or Haikou you won’t have to travel far to enjoy some memorable golf. The hardest part is which courses to choose. 28 Oct 2013: Rory McIlroy gave himself something to cheer at the end of a barren year when he beat Tiger Woods in an 18-hole event at Mission Hills on Hainan Island in China. McIlroy carded a six-under-par round of 67 to beat the world No 1 by a single shot. HAIKOU, China -- Mission Hills China played host to the ladies professional golf tournament - the World Ladies Championships (WLC). It was played on Mission Hills Hainan's Vintage Course, and hosted by the China Golf Association (CGA) and Department of Culture of Radio, Television, Publication and Sports of Hainan Province. With the inaugural World Ladies Championship, Mission Hills Group will have staged a 'grand slam' of major events in all competition formats.